If you were a rat, you'd chow down for about 15 minutes, feel full, and stop eating. But you aren't. You probably eat so fast that your stomach hardly has time to alert your brain to tell your mouth to quit chewing before your stomach explodes. Solution: Try this drill during your next meal. On every bite, chew, swallow, put down your fork, and take a sip of water. See how long it takes you to eat. Now, during subsequent meals, take just as long to eat, only without the drill. Another meal-prolonging trick for men with regular dinner partners: Turn off the TV, put down the Daily Racing Form, and actually have a conversation. 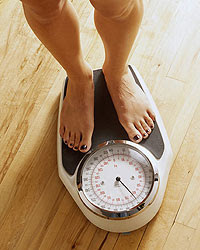 Slashing too many calories, particularly protein calories, pushes the body to conserve calories rather than burn them. It also forces your body to break down muscle tissue to fuel its vital operations. But that muscle is the key to your metabolism, or the speed at which you burn calories. More muscle means a faster metabolism and less body fat. Solution: You do need to cut calories to lose weight. (Cut 500 today by eliminating one can of beer, 30 chips, and one Oreo from your diet.) But you need to make sure you're eating at least 1,600 to 1,800 calories each day to keep your metabolism from shutting down. And never cut protein during a diet. If you're a sedentary 200-pounder, you need about 75 grams of protein (about two chicken breasts) a day for muscle preservation. If you're lifting weights, aim for twice that much. Doing aerobics? Pick a number in between. Sleep deprivation decreases the odds of shedding blubber and keeping it off. Researchers found that healthy men who snoozed only 4 or 7 hours a night for 6 nights in a row had higher glucose and insulin levels in their blood. This is a terrible state of metabolism for a man who's trying to lose weight, because surplus insulin boosts body-fat storage. Solution: Hit the sack for 8 hours each and every night. And try to hit it for the same 8 hours. That is, establish a regular bedtime and waking hour. Pick the time you have to wake up on most days, and make sure you're in bed at least 8 hours before. Company is optional. Most processed breads and cereals contain little fiber, the calorie-free component of plant foods that fills you up, not out. Plus, foods rich in fiber help control blood glucose and insulin levels. Solution: I never thought I'd say this, but it may be a good idea to cut back on potatoes in any form (especially the fries, fellas). Experts say potatoes raise blood-glucose concentration quickly, as do snack chips, white bread, low-fiber breakfast cereals, and breakfast bars. Whole-grain cereals, nuts, and beans are blame-free, if not calorie-free. Have another one, bud. Another tall, ice-cold ... glass of water. When you're trying to lose weight, water is your workout partner. You need it to flush the waste products your body makes when it breaks down fat for energy, or when it processes protein. You need it to transport nutrients to your muscles. You need it to help digest food and keep your metabolism clicking along. And water keeps you from overheating during intense exercise on hot days. Solution: Start the day by filling up a half-gallon jug with water (or any combination of smaller bottles that equals 64 ounces). Your goal is to drain the lot by the end of the day. Clear or light yellow pee is the universally recognized sign of good hydration. So you took wood shop instead of home ec. I understand -- a man needs to master power tools to feel complete. But unless you find a way to make your bird feeder edible, you need to master weight-loss tools, too. A man whose only kitchen skill involves the speed dial to Domino's is condemned to a diet of grease, salt, white bread, and sugar. Solution: Step into the kitchen. (That's the room with the oven, sink, and refrigerator.) Open your freezer. You should see frozen berries and vegetables, which are as good as fresh but last many times longer. Look in your cupboards. You should see some canned vegetables, hearty low-fat soups, dried fruit, and slow-cooking oats. These foods help you lose weight because they're filling but low in calories. Best of all, you don't need much more than a can opener and a microwave to make them edible. (Dishes are optional.) This leaves you more time for your power tools. Exercise alone won't make you thin. A recent study of military personnel who increased their exercise during a 3-year period found that they gained weight despite their extra efforts. Why? Food, most likely. They simply ate more than they burned off. Solution: The last thing you want to hear, especially from a female, is that size matters. But trust me on this: Controlling portion size is absolutely essential to weight loss. And the best way to control portion size is to limit how often you eat out. So there you have it, the keys to the kingdom.